A preview of what's to come in the Director's Office this academic year. Well, the new division-focused format clearly works. Readership dwarfs anything my recurrent columns generated in years past, as the targeted messages from my colleagues are hitting the spot. Three cheers for them and for you for choosing to stay informed. What’s left for me is to paint a broader picture, intermittently. In that spirit, let me offer a window into a process that's second nature now on my end but probably unfamiliar to most of our school community. Each summer, after reflecting on distance traveled for the school up to that point and on emerging opportunities, I write a letter of agreement for the Board president to co-sign. In that document is a brief state of the school from my vantage point, and then a short list of priorities. Those enumerated projects constitute the basis of an annual evaluation conversation in June with Board officers. In short, whatever makes the list for the letter of agreement better have been accomplished by the end of that year. If not, there needs to be a reason why. Sometimes, but not often, an initiative wraps around into a succeeding letter, as was the case when I just couldn't finish my doctoral degree a while back. As a tool for staying focused, that letter really works for me. I actually tote around a copy in the dog-eared folder that goes with me day by day. So what's on the list this year? Here's a link to the full text, but for those of you more pressed for time, it's a series of things consistent with us resuming life after a successful Centennial Campaign and a year of visiting schools with outlier models, a kind of back-to-basics move. First among equals in priorities is to spend more time visiting and learning from our K-12 classrooms. Also included are next steps supporting our reorganized Office of Diversity and Community Life, identifying next curricular projects in our effort to demonstrate best practice, and providing more visibility for our division heads as leaders for the school—and the new division publications, P.S., are a case in point. The good and talented people who combine to form our Admin Team at USN create similar priority-setting letters to share with me each year in turn. That practice strikes me as more productive, more timely, and less bureaucratic than some kind of five or 10-year strategic plan that lives in isolation. We plan as we go, taking no year or point in our longer narrative as a school for granted. Before we get too far into autumn, in a commitment to transparency as well as hearing your impressions, I’m grateful to send this your way. And before signing off, let me just add the sincerest sentiments of gratitude to the multitude of USNA volunteers who brought Fall Fest and the Book Frenzy to life. What a pair of home runs here in the October seasonal run-up — the USN version of our favorite pastimes. 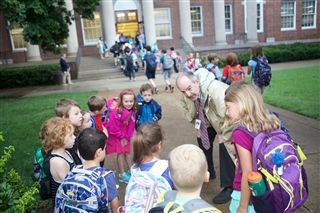 Director Vince Durnan talks with kindergartners on the Edgehill lawn before walking them to class.